Kimbra appears Wednesday, Jan. 31 at Union Transfer. Less can be more. Kimbra recorded her debut album "Vows" in 2010. Few outside of her native New Zealand and Australia heard the 13-song collection, which clocks in at just 55 minutes. However, the Kiwi's sublime cameo, a minute's worth of singing during Gotye's massive hit, "Somebody That I Used to Know," turned the photogenic vocalist into a known commodity since the smash was the top-selling digital song of 2012. A staggering 6.8 million units were sold and it was the top streamed album of the year with 45 million streams. The unorthodox tune put Kimbra on the map. "That's always amusing to me since I never expected 'Somebody That I Used to Know' to become a hit," Kimbra said while calling from Washington D.C.
"We both knew the song was very powerful but it's so unusual, since the chorus doesn't come in until two minutes into the song, but for some reason, people love it." After winning a Grammy courtesy of "Somebody That I Used to Know," Kimbra, 27, followed up the duet with 2014's stylish "The Golden Echo." The playful songs travel in a number of directions. Kimbra looks back and pays homage to '80s and '90s pop. "That's just where I was at that time," Kimbra said. "Get ready for something else from me." "Primal Heart," Kimbra's third album, which will drop in April, is considerably different than anything in her canon. 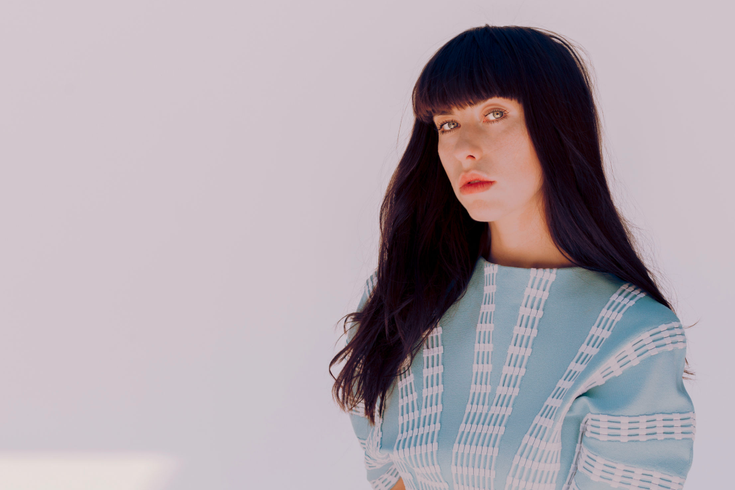 The new material, which will be showcased when Kimbra performs tonight at Union Transfer, features her most direct tunes. It's a bass-heavy project inspired by hip-hop and R&B. "This reflects my growth," Kimbra said. "This album is a product of all of the touring I've done behind 'The Golden Echo.' I've seen the world and it has had an impact. And then there is the part about me living in New York City for the last two years. I have a new sense of courage from living there. All of the positive and negative aspects have hit me. For the first time, I'm writing from experience." The laid back soprano has a wide vocal range. It was evident to her peers, at an early age, that Kimbra's set of pipes are extraordinary. "I fell in love with singing when I was really young," she said. "I wasn't aware of a possibility of a career as a vocalist until I was in high school. I ended up being ranked number two in the country while I was in high school. That was huge, since it gave me this massive boost of encouragement. I thought I could do it." Kimbra signed with Warner Bros. Records at 19 and took off, courtesy of Gotye. "There is something magical about 'Somebody That I Used to Know,'" Kimbra said. "There has to be, since it's one of the most popular songs of this decade. It was great at the time, but I've moved on." "Top of the World," the initial single from "Primal Heart" is scoring airplay on satellite radio. "The airplay has helped a lot," Kimbra said. "I see more and more people coming to shows. I love playing these larger halls. I've taken gradual steps. It's all been good. I'm now known for more than 'Somebody That I Used to Know.' Life is amazing. I have a new album and a new tour and anything is possible." Kimbra appears Wednesday, Jan. 31 at Union Transfer, 1026 Spring Garden St., Philadelphia. Tickets are $25. Show time is 8 p.m.